There could be five Premier League clubs in the last eight, with Tottenham, Manchester City, Chelsea and Manchester United potentially joining the Reds. 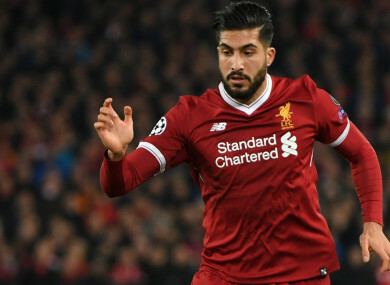 LIVERPOOL MIDFIELDER EMRE Can would prefer to avoid playing an English club in the Champions League quarter-finals. Jurgen Klopp’s men cruised through the last 16, drawing 0-0 with Porto on Tuesday to complete a 5-0 aggregate success. There could be five English clubs in the last eight, with Tottenham, Manchester City, Chelsea and Manchester United potentially joining Liverpool. While Can is unfazed by his team’s next opponents, he would like to avoid facing a fellow Premier League club. “I think you are wrong if you play a Champions League game and you don’t find motivation,” he said. Overcoming Porto saw Liverpool into the quarter-finals of the Champions League for the first time since 2008-09. Defender Dejan Lovren feels his side are in good enough form to reach the decider. “The goal is step by step. Let’s see who we will get in the quarter-finals,” the Croatian said. Email “Can wants Liverpool to avoid all-English quarter-final”. Feedback on “Can wants Liverpool to avoid all-English quarter-final”.